Just a quick note: The Rust Monster blog may be dormant for a while. My father's been in the hospital since the beginning of the week and it looks like he could pass away any day. The blog, therefore, is going to be on hold indefinitely, and if I'm remiss at responding to anybody's e-mails over the coming days or weeks, I hope you'll understand why, and trust that you'll forgive me. I was planning a big one-year blogiversary post for the 22nd, but it looks like that won't be happening now. In lieu of that, let me just thank everyone for supporting the Rust Monster for the last (almost) 365 days. I especially want to thank Sham aka Dave, Jeff, and James, all of whose blogs inspired me to start this little project and continue to inspire me to enjoy my hobby to its fullest with every post I read. I hope your holidays are fun and full of joy - I'll see you all again next year. You're in our thoughts here, my friend. Definitely focus on priorities, and blogging over family ain't it, so rest assured we'll all be here when you need us, and when you're back. Be well, and take heart. I'll be thinking about you during these challenging time and pray you have peace and hope in the midst of stress and sorrow. You know we are all thinking of you and your father. As my grandmother used to say, "consider yourself hugged." My mom passed away this summer. It's a hard time. Rejoice in all the great experiences you've been lucky enough to share. Sorry to hear about your Father and I hope for the best, Chris. you have my sympathy - I hope things turn out as well as they possibly can. I hope your dad pulls through. My mom was in the ICU for a week last summer and it was a harrowing time. Get your dad up and on his feet, we will be here. God bless. We'll be here when you're ready. Sorry to hear this Chris, I hope for the best for your Dad. We'll still be here when you get back. My sympathies for your troubled times. Best wishes for you and your family. I've enjoyed your blog very much, most especially your wonderful hand drawn maps. You'll obviously be missed from all the comments and I hope your dad pulls through too! Thank you all for the kind words. My father passed away shortly before midnight last night, but all of your good thoughts are appreciated. @Chris - I'm really truly sorry for your loss. I hope it was a good passing and that you can find peace and solace. I am also really sorry to hear this. My thoughts and prayers are with you at this time. Sorry man. Thanks to everyone. It's been a really rough couple of weeks, but I'm going to try and get things to some semblance of normalcy around here. 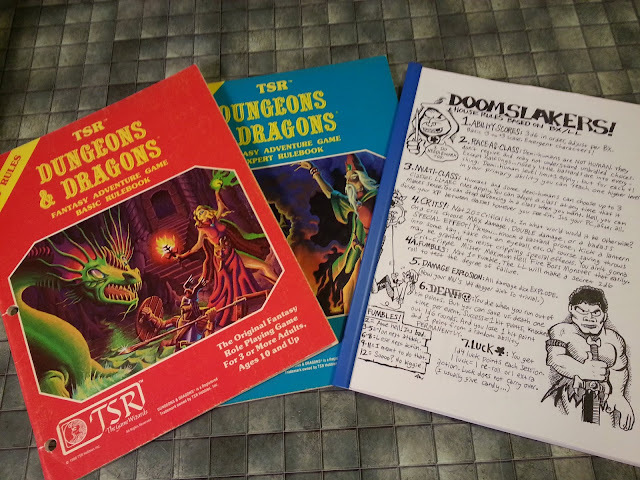 Chances are that you are already familiar with the Kevin Singer case, a lifetime inmate of a Wisconsin correctional facility who has been prohibited to enjoy his D&D games with cellmates out of incredibly bigoted and unrealistic fears he was forming a "gang". An online petition has been started to have that absurd ruling reviewed and I think that, as fellow gamers, I thought you may have wanted to support the effort, showing that RPGs can be potent educational tools for the acquiring of social, cooperative and reading/writing skills from which the prison population could surely benefit. The more time passes the more I am convinced that the u.s. prison system is not a corrective tool with which to re-educate and win back to society inmates but a kind of medieval torture system with which to abuse and degrade those unlucky enough to enter it. please, there is a person who is being denied the solace and comfort of letting his mind and his imagination soar while his body is restricted in a cell, and, if you can, circulate the petition's URL link among your fellow gamers and friends.